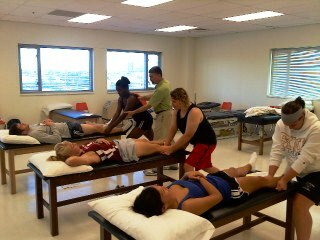 Mark Frank LMT, owner of the St. Louis Insititute for Rehabilitative and Sports Massage (http://www.stlmassageinstitute.com/), conducted a lab for SLU Athletic Training Students on Thursday, November 4, 2010. He is an expert in Structural Integration, a type of manual therapy which he uses on a wide variety of professional, collegiate, high school and recreational athletes. Mark also has worked with the Cirque de Soliel and the British Olympic Team. 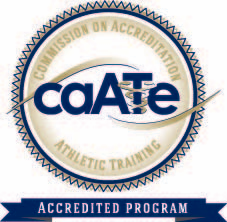 Assisting him with the hands-on lab experience was Lori Khazen, ATC, CSCS, owner of Khazen Athletikare (http://www.athletikare.com/). We truly appreciate Mark and Lori taking their time to help give our students a valuable tool to use as an athletic trainer. 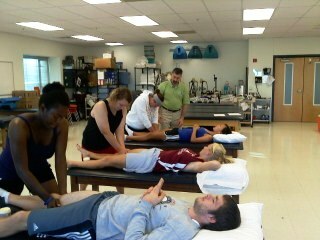 Mark Frank LMT demonstrates a fascial spreading technique for SLU AT student Kacey Morrison. The lab provided an excellent hands-on experience.